"They said its not cold in NC!" Cannot believe how puffed up the cardinal is...hope it helped him keep warm in the storm! I do so love this shot, it is magnificent. And also I feel so sad for this beautiful Cardinal, he's all puffed up against the cold. But, I guess like you said, he's ok with hanging in NC. This is a wonderful shot and would make an amazing Christmas Card. Love the shot, but don't feel too sorry for the cardinals. They stay year 'round up here, where it gets much colder for much longer than in NC, even with the anomalous weather you've been having. It doesn't seem to bother them. Beautiful. They do bring a pop of color to the cold. Beautiful shot - poor little guy, he does look chilly. cardinals always look so stoic; this one also looks fat and fluffy! 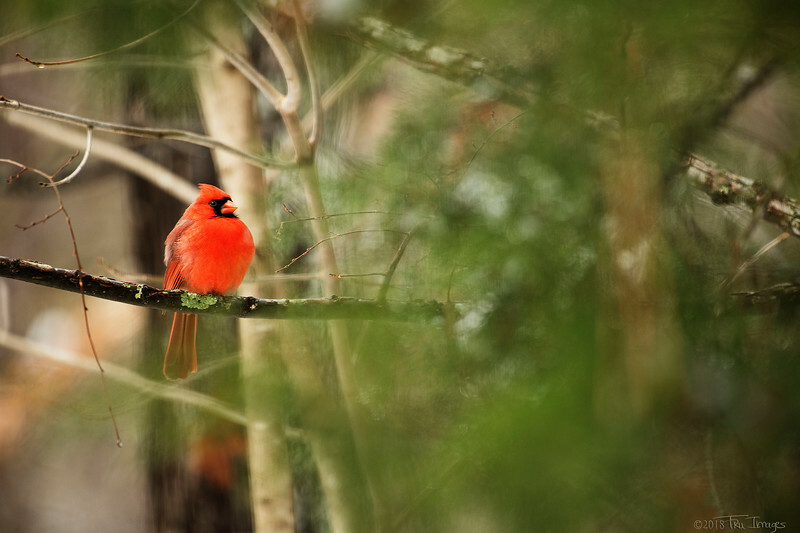 Wonderful shot of it with its bright red feathers lighting up the winter day!